Are you looking for biodegradable seed starting pots? I have an easy solution. 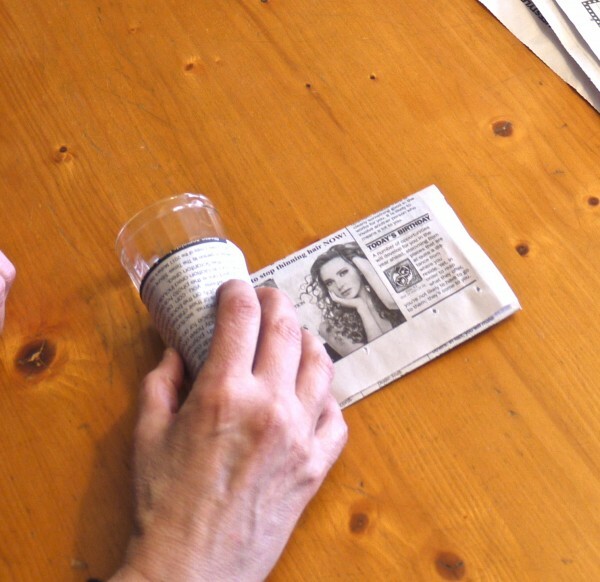 Make your own seed starting pots from newspaper, and they’ll be no reason to purchase plastic. You can quickly make dozens of seed starting pots, and the kids can get involved with this fun project. I recently received a copy of Family Homesteading: The Ultimate Guide to Self-Sufficiency for the Whole Family by Teri Page. 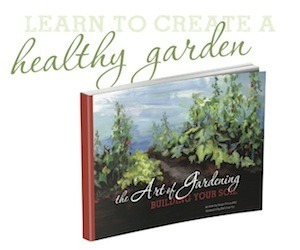 This fun book is full of all kinds of homesteading projects that kids can do. I’ve followed Teri and her husband Brian’s homesteading journey for many years at Homesteading Honey. I admire, and completely agree with their philosophy of training their children to be skillful and capable, even at a young age. Their two children have been involved with virtually every homesteading project they have undertaken. 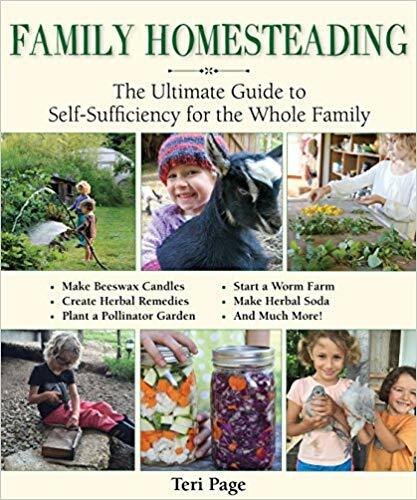 And Family Homesteading: The Ultimate Guide to Self-Sufficiency for the Whole Family helps the reader to see how doable homesteading is with children. 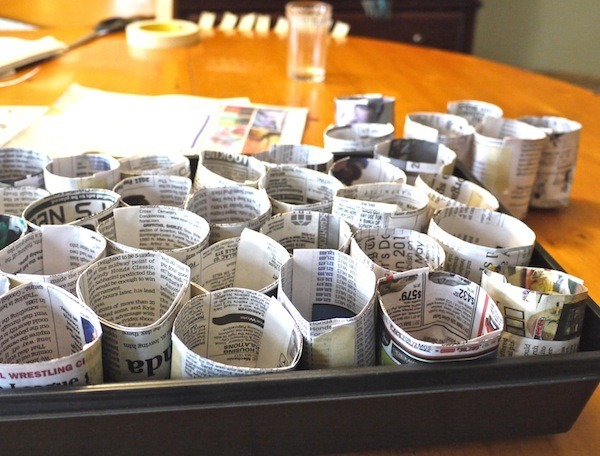 Begin by cutting each full sheet of newspaper into four. Then fold each square into thirds. Roll the folded paper around a small juice glass so that about an inch or less of it overlaps the bottom of the glass. Fold this overlap down, and tape with a small piece of masking tape. The tape will eventually decompose right along with the newspaper. Remove the pot and you are done; your newspaper pots are ready to be filled with seed starting mix, and seed. Here are some tips for seed starting. 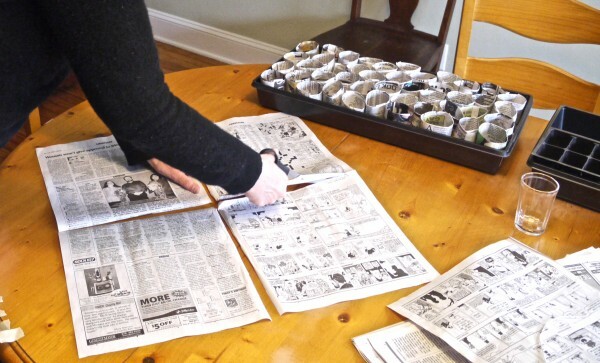 To plant, simply place the newspaper right in the ground where it will quickly decompose. Be sure to cover all parts of the newspaper with soil when planting. Any newspaper that remains above ground may wick moisture from the soil. What a great way to recycle & garden! This is fantastic! Maybe I can actually participate this year in the process by doing this. It was helpful to know that it only took under an hour. Such cute pots & such a cute you! Thanks, Susan! Great Idea ! I think the toilet paper and paper towel rolls are a great idea! I’ve seen the wooden thing to which you are referring but I thought I could figure out a way to do the same thing without it. It’s really easy, too. Rosalyn, I just planted a bunch of seeds using toilet paper rolls, but have found that the glue tends to come loose when I water them and they unravel. Make sure that you have the rolls packed tightly in a box or something to hold them together. That is my plan too. I need to transfer a few of my seedlings, and the paper pots seem to be the right size. I agree that the rolls worked pretty well. I did this as a project with my kindergarten class. The rolls were easier to use with them, but I intend to use the paper myself. I’ve “hopped” over from Teach Me Tuesdays – great idea! Thanks for sharing! Blessings from Wisconsin. Thanks! Easy and free, too! This is a good recycling idea–I may have to try it if I run out of pots this year! Thank you for posting. You’re welcome! I no longer have to purchase pots; it’s great. WONDERFUL! Thanks for sharing how to do this. I’m going to save the paper tomorrow! Glad to help. Thanks for visiting! Terrific idea! – thank you for sharing. I linked onto your site from the Homestead Barn Hop. I do have a couple questions for you. Do you use regular potting soil to fill each of the cups? When you water them before transplanting, does the newspaper hold up well? I made about 30 of them tonight with today’s paper and was wondering how to use them now that they are sitting here waiting so patiently! Any more advice you can share would be wonderful. Glad to have found your site! Hi! Glad you found us as well! Your questions are great. Rather than potting soil, I purchase a mix made specifically for starting seeds. These are generally soilless and are less prone to disease. A good garden center should be able to help you. I have found that the newspaper holds up just fine. By the time I am ready to set my plants out in the garden they have begun to decompose but are not falling apart. Good recycling! Last year I used toilet paper tubes cut into thirds and set in a tray as seed starting pots. I haven’t tried that, but I think it is a fantastic idea! Thanks for sharing your idea. Anything that we can do to re-use and recycle is terrific. Now we all want to see the terrific seedlings that you are going to grow in all of those little pots! Happy Spring! I LOVE this time of year!!!!! “I” just threw out all the newspapers, not it! If your house is like mine, there will be more in no time!! This is such a great idea! And then you can just stick them right in the ground. Yes, so easy, and free! Thanks, Nancy! Glad I found you and thanks for hosting Rural Thursday. Thanks! Hope you have the opportunity to try it soon. You are welcome! I love that we all can learn from each other. My obsessiveness rebelled against those loose edges!! ha ha. Thanks for visiting! Thanks for sharing this great gardening tip on Farmgirl Friday. What a great idea in a pinch. Sure hopes this works for you better than it did for me when I tried it last year! The pots grew so much mold in our cool house that the seedlings were stunted. 🙁 I’m back to using my recycled plastic pots. Glad you shared at the TGP and I really look forward to seeing more of your garden (and how those pots work) ! Oh, so sorry to hear that happened to you; I have not had this problem in the past. In a cool house you probably need a lot less water. Gardening is my passion! I abosolutely LOVE this idea!! Frugal, smart and a great way to recycle (: Thanks so much for sharing! Hi and thanks for the tip- long story short, I’m preparing to work with our Keepers 4-H club on starting seeds for a butterfly garden project for our local library. I was looking for a way to recycle things we have “in our hand”….I’m excited about reading more. I also glanced at “Born-Again Dirt” and just made it my #1 item on my birthday wish list!! We live in a lovely rural NC community – I have a heart for sharing God’s creation with others- we’re working on establishing a Monarch habitat/butterfly garden/ outdoor classroom at our library, so the timing for this is perfect!! Hi Deb, your projects sound so wonderful! I was incredibly blessed by “Born-Again Dirt” and I hope you will be as well. If you are inclined, when you do decide to order, please click through my link. That way, I make a small percentage. I’m just trying to off set time I spend on my blog. Thanks for visiting! I have tried the toliet paper rolls last year. The theory is great, but they are not practical. The way they hold water (or don’t hold water) is the hardest part to keep up with. Once you get that figured out and you need to move things around they have no stability, they simply fall apart. They also can mold, so you really need to keep a fan going. I love to recycle and be thrifty, but in my opinion you should not waste your time with these methods, as well as the egg carton (not enough room,etc). Save your seed trays from year to year. Taking care to not crunch them, and wash and bleach with a 10% solution every season. I have had some for 5 years! I don’t want to offend anyones ideas, but I have tried first hand. Hi Heather, thanks for stopping by and sharing your experience. I’ve used the newspaper pots for several years and have had success. Perhaps you are overwatering, if you are having a mold problem. Hello All- I used toilet paper rolls last year to transplant my aspargus that I started from seed. It worked out really well since I left the TP roll up about 1/2 above the soil. It made it easy to water them (water pooled inside) and easy to find them. I’ll have to see how they look once the snow melts- they will be 1 year old and ready to transplant from the nursery bed to the permanent bed. I’ll use this method since I ran out of tp rolls last year. I’ve got some ornamental grass seeds in a 1 lb fresh green mix plastic box in tp rolls. These packages make excellent little green houses. I save all of mine and raid the recycle trash of my local organic restaurant for their plastic containers with covers. With tp rolls holding the baby grass plants I will not pull them up with the regular weeding. Popped over from Tilly’s nest. Love the post! I never seem to have enough newspaper to do this. Hmmm, I will have to search for paper that is being tossed out. Thanks for sharing this on The HomeAcre Hop!!! Can’t wait to see what you share this coming Thursday 🙂 Here’s the super easy link to the next hop! I love this idea since I am trying to garden this year without spending more than I will save! (Although healthy and handy veggies are a reward in themselves, being frugal about it makes it even better!) here is my question: can anyone tell me why it is important to start with small seed-starting pots and continue to transplant into bigger sizes until they are ready to transplant outside? Well, I don’t. Since seedlings are generally in their pots for only 6 – 8 weeks, I don’t find the need to transplant. Hi Susan! I’m featuring this post on The HomeAcre Hop! Yes, I know…that’s 2 posts being featured today 🙂 Because they are so great I want to share them! What a great idea. I used the cardboard egg cartons to start mine in this year. This is my first year of starting seeds for a real outdoor garden, instead of just doing container gardening. Thank you so much for sharing this great tip – this will greatly help me since I more often than not forget to buy such pots (those that are environmentally friendly of course) and end up with having to use plastic pots. I hate that. Moreover with newspaper I think I use recycled stuff that is biodegradable. Am I right? Wrong? Hi Holly! Yes, the newspaper pots are biodegradable. Great idea. Just remember to avoid using the shiny, colored newspaper pages, which are toxic. This is a great idea. I just did a blog post on how to use toilet paper rolls (and I fold the bottom not glue them and they are working well). I have a question though. How does the paper hold up under regular waterings? Hi Audra, the paper has held up just fine for me; the only problem I have ever experienced is that if I over water, it molds. I’ve tried the paper pots a couple times and got mold each time. I see your warning about over watering and will watch that. I used potting soil instead of a seed starting mixture and wondered if that also increased the likelihood for mold. Hi Kristel, I tend to be an overwaterer myself, and that’s the only time I get mold. I know that it’s not recommended to use potting soil to start seeds, but I’ve not used it myself to know if that could be part of your problem. 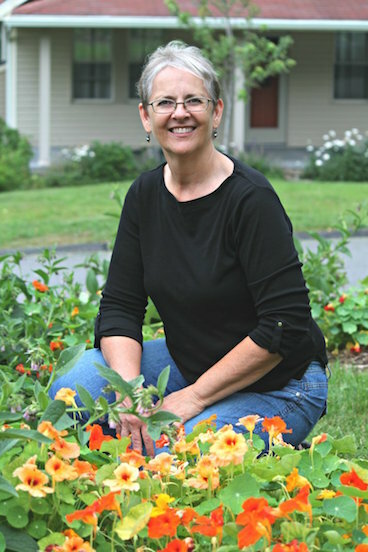 Hi Judith, yay for you for taking the step to start your own seeds! Yes, mold is caused by over-watering. The soil needs to be kept moist, but the paper pot itself should be on the dry side. If you go to a local garden center, they should have an inexpensive moisture meter to help you monitor the moisture if you are having trouble. Like this: http://amzn.to/10ZFj4u. What about the printing ink bleaching out on the roots. Any danger? Jimmy, only use newspaper with black ink – these are soy based and safe to use. Just be sure to avoid newspaper with colored ink. I just use the weight of the wet soil in the starter instead of tape. I certainly don’t want to pick bits of plastic and adhesive out of my garden soil, let alone think of what nasties it’s putting in my soil/veggies! ew! The tape I use is made of paper; no nasties! I did this today while watching Grey’s Anatomy. It was so easy and I used leftover ads from work : ) I love that I can just plant them in their containers! Can I use any other types of paper to avoid the risk of ink leaching into the soil? Or newspapers have Special specs? Hi, Ahmed, newspaper ink is soy-based and is safe for gardens. Just don’t use any shiny, colored sections. Brown paper bag paper would make a great alternative. Thanks for stopping by!